Much has been written about the identities of Crispinus, Demitrius and Horace in Poetaster. But scholars are less sure of the identities of Ovid and Virgil, although Ovid is admittedly the central figure in the play. My sense as I work through plays of this era is that there is a qualititave difference in how personal allusions are protrayed for satirical purposes compared to how allegories are presented to portray events and circumstances. The latter does not necessarily have finely-drawn personal characters, as the portrayal of the event or circumstance, and not the person is the goal. These allegories present difficulties for us, since they portray events purposefully obscured from the censors of the time, and now have been obscured by hundreds of years. Needless to say, we are going to miss most of these allegories. My approach for identifying the events and circumstances is to locate similar allegories that act as cross references and thereby build a stronger case via multiple literary examples. As I often state here, one example is hearsay, two is journalism. Ovid in Poetaster portrays Shakespeare/Vere, but it is not a finely drawn allusion. It is the events surrounding him that are presented as allegory. But there is enough there for us to link Poetaster’s Ovid to the Great Author. Ovid is the most prominent of all literary sources for Shakespeare. Vere was “Nos’d to Naso” according to Gabriel Harvey. Ovid called himself “Naso” (the Nose) in his poems. Other Vere allusions link to Ovid, such as Gyles Goosecappe who carries an work of Ovid on stage. The poet Ovid of Roman history was exiled by Augustus. History doesn’t tell us why he was banished. In Poetaster, Ovid is banished here as well. Jonson’s construction of the how and why is therefore fictional. Given Vere’s seeming disappearance from relevence and history, Jonson’s Poetaster may give us insight into those circumstances and events, via allegory. In Poetaster, Ovid organizes a ‘banquet of the gods’ that the poets and their consorts attend. The literary idea of a banquet of the gods goes back to Homer. Chapman’s poem, “Ovid’s Banquet of Sense ” is relevant here too. Though Chapman’s treatment is completely different, the idea of Julia, Augustus’ daughter as Ovid’s lover, and her also being called Corina, are used by Jonson in Poetaster. In brief, Ovid borrows props from the theater for the banquet, including a crown and a scepter that he uses in his portrayal of Jove. 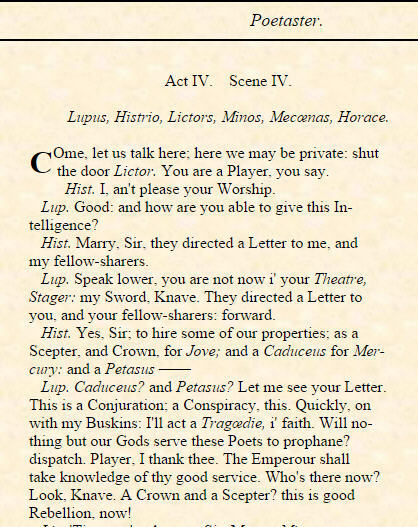 The player Histrio informs to authorities about Ovid’s portrayal as Jove, which leads to the banquet being raided by Caesar Augustus, who then banishes Ovid for treason, and condemns Julia to a life behind “Iron Doors.” Histrio and AEsop as informers has already been addressed here. I believe Julia stands for the plays. Hamlet tells us players are ‘the abstract and brief chronicles of the time.’ In Poetaster we are told that Julia is ‘the abstract of the court.’ There is a rich vein to be explored concerning the portrayals of Vere and his lovers as portrayals of his works. Earl Lassinbergh and Lucillia in Doctor Dodypoll is another example. But that avenue is not our path now. Why was Ovid banished? Jonson’s Horace in Poetaster tells us his opinion. Horace exorciates the informers. But more importantly, he gives us his opinion of Ovid’s actions. In Rome, the emperor was a god. To portray a god, as Ovid did by portraying Jove, was treason against the emperor. If we translate these circurmstances to Tudor England, the offense would be against the crown. The banquet of the gods in Poetaster is piece of theater. It’s a private theater, behind closed doors. But the participants all have parts as gods to play. The banquet as allegory of theater is stressed with Ovid borrowing theatrical props for use in the banquet, the use of which is his undoing. Remember that Robert Greene’s misfortune of too much pickleherring was at a banquet as well. Let’s characterize exactly what it is that Ovid/Shakespeare/Vere does in Poetaster. — He plaid some Kingly part in sport! And that observation, takes us to John Davies of Hereford, and his collection of epigrams, “The Scourge of Folly.” We have already discussed his epigram to AEsop in the previous essay. Here’s his epigram to Mr. Will: Shake-speare. To our English Terence Mr. Will: Shake-speare. 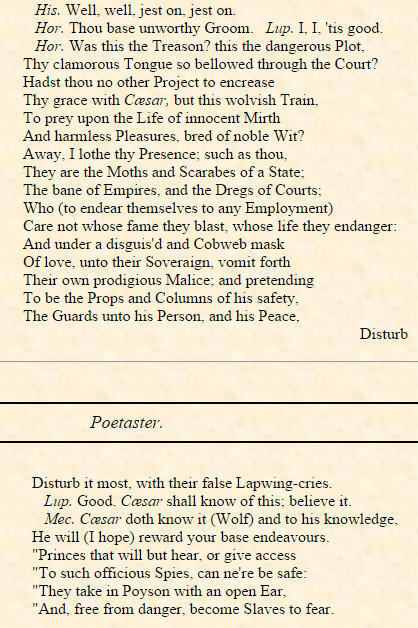 Davies in Scourge of Folly is telling us the same story as Jonson in Poetaster. Shakespeare got in trouble because of his theatrical activities. Stratfordians have always denied this interpretation. One example is hearsay, two examples are journalism. The reference to “Terrence” the Roman author is a sort of marker telling us to look for a Roman connection to his epigram, which Poetaster is. We now come to the consequences of Shakespeare’s action. In Poetaster, Ovid is banished, which is historically accurate. Vere was not banished, though he certainly withdrew from public life. What do we make of Davies’ “Thou hadst bin a companion for a King”? The key word here I believe is “for.” Stratfordian criticism seems to invariably discuss the phrase as if it said “to.’ Companions are normally two-way relationships. I’m companion to you, you are companion to me. The ‘for’ represents a one-way companion relationship. A type of service. I think Davies is referencing the Order of the Garter. Garter members are named Knight’s Companion. It is an official position as a Companion for a King. Companion is normally capitalized in this context, but not always according to the OED. We’ve seen Vere’s failure to attain the Garter satirized in Histrio-Mastix here. Davies is commenting on the same circumstance. We know Vere was regularly shut out completely in Garter nominations from 1590 on save for a single vote from Thomas Cecil in 1603. Even his son-in-law, William Stanley left him off the ballot. Davies message is clear when read alongside the literary evidence from Poetaster and Histrio-Mastix. Shake-speare/Vere was ostracized for his theatrical activities, and exclusion from the Order of the Garter was part of that ostracism.